Kevin Mthethwa is a Durban-based photographer who was born and raised in the tropical city. Currently in his third year at DUT studying Graphic Design, Kevin fills his free time with photography. Kevin chose his five fave photos and describes what he loves about them. For this particular shoot, I worked with Bheki Mthembu, who is also a very talented photographer. The model in this shot is Leah Prinsloo. On this day in June 2018 the team and I left Durban at 4 am on a very cold morning and headed to Thompson Bay for the session. I generally have a clear idea of the frame I’m looking for. However, what makes this frame special to me is the fact that Leah and I did not plan this shot. It had no mood-board and It was completely spontaneous. That strongly resonated with me because it made me feel like I wasn’t replicating an existing picture. The image was truly unique for that moment. Allow me to introduce you to the beautiful miss Shante Gumede. I had the opportunity to work with her and the very talented make up artist Nonto Shezi. The simplicity in this shot is what makes it special to me. I always enjoy capturing images that are filled with a subject in the centre of the frame. I like the way the subject engages with the audience. 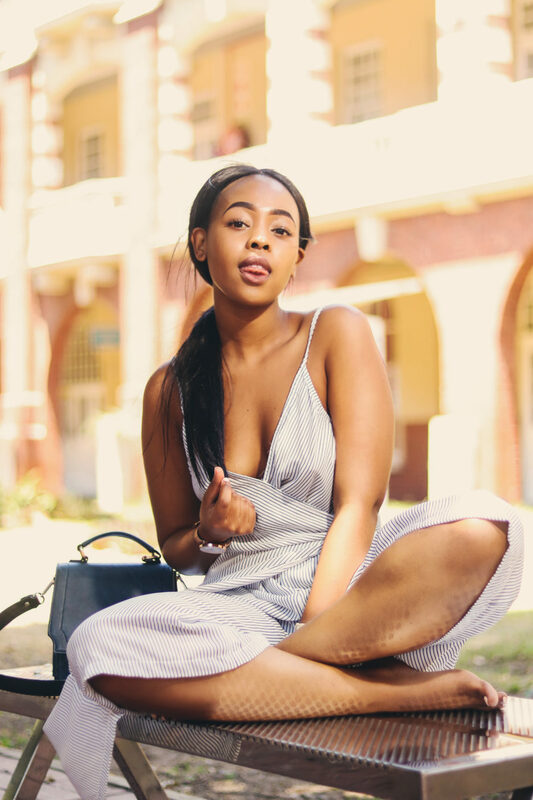 Nandi Zulu is an amazing, kind hearted and bubbly spirit. Her Instagram username is uMakaShaka because she was named after Shaka Zulu’s mother, uNandi. This shot was also taken at Thompson Bay beach. We met on the day we were meant to travel to Thompson beach for the shoot. Photography has always been an interesting experience because you get to tell a story about someone through your eyes. They say the first love is the sweetest love. No offence Mbali, but I’m not referring to you. I had recently bought my first camera ever, a Canon 77d. I took it for a spin to my campus to fiddle with as the varsity had a vast variety of subjects I could experiment with. On that day the weather was beautiful and sunny, the environment was golden and so was the model. This image is a landmark to me. It gave me a sense of direction in terms of the style of photography I wanted to produce more of. This is Snenhlanhla Mchunu, a very close childhood friend of mine, who literally stayed right across my house. We had planned to do a test shoot, something casual and not too serious. She suggested an interesting venue, Pigoen valley. The only downside to this location is that the trees mostly overlap over your head – blocking natural light. I had to improvise, so I decided to use an off camera speed-lite to imitate natural light. This image made it on my list because I was skeptical about the shoot. It was late in the day and we were losing light quickly but we also managed to capture the look that we wanted.